Ink is the razor blade of the technology world. You can get inkjet printers for cheap—often free—nowadays, but you still need to refill their ink cartridges. And that's where you get got as it were. A printer that costs under $100 takes an ink cartridge that costs you $30, or close to one third the price of a printer. Have to refill your printer more than three times, and there's the price of your printer all over again. 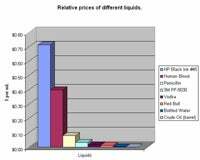 In fact, as it turns out, the cost of printer ink oustrips the cost of many other popular liquids, including bottled water, Red Bull, vodka, penicillin, human blood, and crude oil. Gizmodo shows off a graph created by reader Shaun, in which he compares the prices of these and other liquids. HP Black Ink #45 tops the list, with a price of $0.71/ml, while human blood runs a distant second, at $0.40/ml. Crude oil comes in dead last, just beating out bottled water. That's right: it's back to writing things down on paper for me.